Shop for your next car using AAA Auto Buying to receive AAA Member Savings as well as many other benefits. Search top brands and save. AAA did an excellent job. The guaranteed savings certificate came in even lower than I had initially received from Truecar.com directly. The dealership pulled in the model and color vehicle I wanted from another dealer and I bought it the same day I went to see it. Get your AAA Member Savings before visiting a dealership. Savings also apply to leasing. There is never any obligation to purchase. Work with our prescreened dealers to ensure a better car buying experience. Access unlimited Price & Market Reports, plus compare features, see pictures, read reviews, and check your trade-in value. Finance a car purchased from a dealership. Hear it from our members! Watch this video of one of our very own AAA Members describing his experience with AAA Auto Buying and financing. What does it mean to be pre-qualified for an auto loan? Know how much you can borrow before you start shopping! 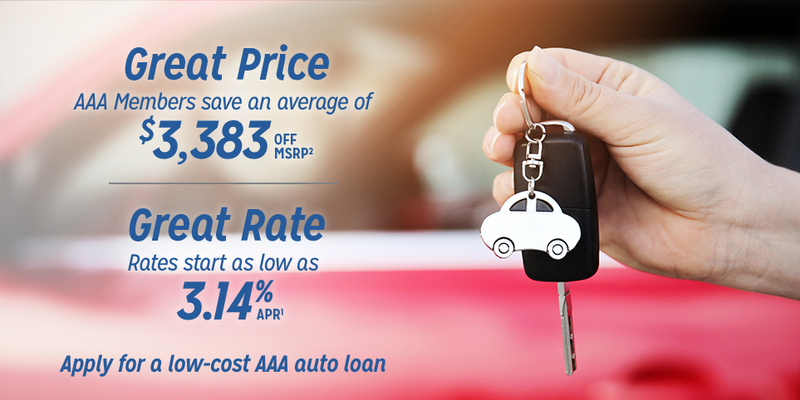 You can shop with confidence by simply providing some basic information through AAA.com/autoloans. We will, with no risk to your credit score, evaluate your credit situation and provide you an auto loan offer. You may also call 844.541.AUTO (2886) for assistance. We are proud to offer our members discounted protection plans without dealer markups that are financed right into your auto loan. AAA is proud to offer special discounted protection plans. If your vehicle is stolen and not recovered or if your vehicle is in an accident and declared a total loss by your insurance company, GAP covers the difference between what you owe on your loan payoff amount for your vehicle and your insurance settlement amount. GAP also provides coverage for up to $1,000 of your insurance deductible. The AAA GAP Waiver can be financed within your AAA Auto Loan. In this example, the outstanding amount you owe would be waived by the GAP Waiver leaving you with a balance of $0. This GAP payment example is for illustrative purposes only. AAA Total Protection Plans provide worry-free protection against covered repairs to your vehicle. With a $0 deductible, you can select any authorized, licensed repair facility throughout the U.S. and Canada. AAA Total Protection Plans can be financed within your AAA Auto Loan. Source: 2016 costs based on data provided by Assurant Solutions. Actual costs may vary. You’re just a few clicks away from knowing your pre-qualified amount and rate without affecting your credit score. Need assistance? We are happy to help! Rates and terms effective as of 4/1/2019. Advertised rates and terms are subject to change without notice. Additional terms and restrictions apply. Other loan rates available. Subject to borrower qualification. Advertised rate assumes a 0.25% discount when you set up automatic payments from any checking or savings account. Offer valid on personal vehicle loans only. Criteria to receive the stated APR: Loan term 48 months or less, vehicle model 2018 and 2019 new or used models, with an excellent credit score. Borrower pays any closing costs. Auto Club Trust, FSB uses a managed credit program and final APR is dependent on your credit score. An auto loan with an APR of 3.14% for a $35,000 loan at a term of 48 months, your monthly payment would be $776.87. Between 7/1/17 and 9/30/17, the average savings off MSRP presented by TrueCar Certified Dealers to users of TrueCar powered websites, based on users who configured virtual vehicles and who TrueCar identified as purchasing a new vehicle of the same make and model listed on the certificate from a Certified Dealer as of 10/31/2017, was $3,383. Your actual savings may vary based on multiple factors including the vehicle you select, region, dealer, and applicable vehicle specific manufacturer incentives which are subject to change. The Manufacturer’s Suggested Retail Price (“MSRP”) is determined by the manufacturer, and may not reflect the price at which vehicles are generally sold in the dealer’s trade area as not all vehicles are sold at MSRP. Each dealer sets its own pricing. Neither TrueCar nor Auto Club Trust, FSB, sells or leases motor vehicles. Member Savings currently not available in all states. In these states a “Target Price” is presented, which reflects a market-based example of what you can reasonably expect to pay for a vehicle configured with your desired options. Your configured vehicle may not be available or in-stock at the Certified Dealer. TrueCar operates this information website (“Service”) featuring pricing, performance, technical, and safety data available for new and used vehicles. The Service is not available in all locations. This calculator is for informational purposes only and does guarantee an offer or loan approval. Actual terms will vary. Insurance underwritten by one of the following companies: Auto Club Insurance Association, MemberSelect Insurance Company, Auto Club Group Insurance Company, Auto Club Property and Casualty Insurance Company, AAA Insurance Company, Auto Club Insurance Company of Florida, and non-affiliated insurance companies. New policyholders obtaining insurance through AAA saved annually. Average annual savings were based on 2015 survey results provided by new policyholders reporting the dollar differences between prior carriers and insurance through AAA. Protection plans are available on eligible loan products. Your purchase of the AAA Guaranteed Asset Protection (GAP) Waiver is optional. Whether or not you purchase the AAA GAP Waiver will not affect your application for credit or the terms of any existing credit agreement you have with the bank. The total fee for the AAA GAP Waiver is $299.00. Adding the lump sum of the fee to the amount you borrow will increase the cost of the AAA GAP Waiver. You may cancel the AAA GAP Waiver within 60 days and receive a full refund. You have the right to cancel the AAA GAP Waiver in the following circumstances: You may cancel the AAA GAP Waiver within 60 days if you have not made any request for benefits using the AAA GAP Waiver. The bank has no right to cancel the AAA GAP Waiver. There are eligibility requirements, conditions, and exclusions that could prevent you from receiving benefits under the AAA GAP Waiver. You may find a complete explanation of the eligibility requirements, conditions, and exclusions in paragraphs covering Agreement Limitation on page 2 of the GAP Waiver agreement. We apologize for any inconvenience and appreciate your patience. Thank You. © Auto Club Trust, FSB. All rights reserved. Serving AAA Members and residents of Iowa and these Minnesota counties.